With its crimson accents, sharp angles and four front-facing speakers, the Acer Predator 8 looks like a tablet built for serious mobile gaming., but that’s as far as it goes. I’ve been pleased with what I’ve seen so far of Acer’s most recent gaming-aimed products, so I figured I would see what else the red-and-black Predator line had to offer. 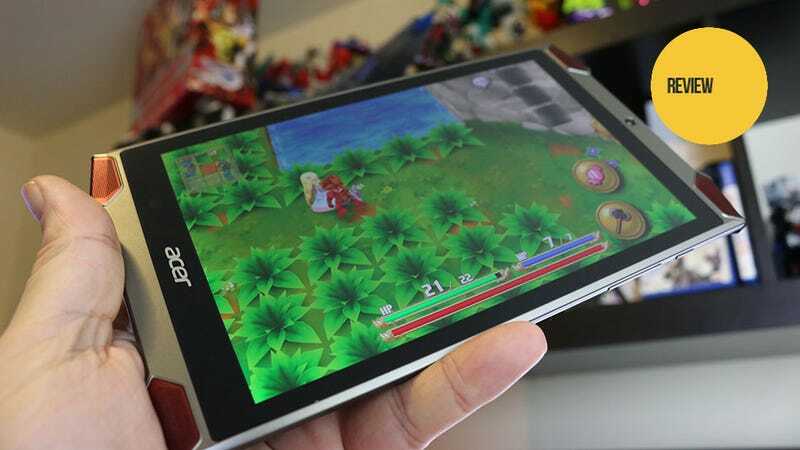 As a mobile gaming aficionado, the next piece of Predator hardware that caught my eye (not counting the curved monitor) was the Predator 8, an Android-powered gaming tablet that looked like nothing I’d held in my hand and stroked in an interactive entertainment fashion before. They’re almost trying too hard, really. Most of the gaming-centric Android tablets I’ve played around with have been relatively subdued affairs. The Nvidia Shield tablet comes to mind, a perfect black rectangle with a couple of rows of speaker dots at either end. It doesn’t scream gaming, but when it does game it screams. Acer seems to have taken the opposite approach here. Every aspect of the external design of the Predator 8 looks to have been designed with someone’s idea of gaming in mind. The plastic case is built to take a tumble. The rear of the unit features raised ridges to act as grips for handheld landscape-oriented gaming. The red accents on the back and the grills of the four speakers give it that “look at me being all gamer-y and stuff” look. Simulated surround sound? Haptic feedback for supported titles? Gaming, gaming, gaming. Upon receiving the Predator 8 for review I tore open the box, let the unit charge for a bit, ran through setup and then headed straight for my Android testing go-to, Gameloft’s Asphalt 8. Or at least I did once I got past all of the extra nonsense that came pre-loaded on the Predator 8. Eventually I started up Asphalt 8, cranked the settings up to highest—this is a gaming tablet after all—and began to race. The action was sluggish, frame rates slow. Figuring the high setting might be there for future devices with power beyond current day Android systems I tried medium. Better, but still a little sluggish. The speed and fluidity I craved finally came at low settings, which is completely not okay for a gaming-focused piece of hardware. Basic Android games work just fine. The none-too-demanding yet incredibly pretty Adventures of Mana from Square Enix played rather well. But anything more demanding taxed the system, and when the Predator 8 is taxed you can feel it. This tablet runs hot when it’s pushed, which is fine for a PC but not optimal for a device you’re supposed to hold in your hands. This is a $300 piece of hardware that’s aimed at the Android gaming market. It should have the power to play just about everything perfectly. The Nvidia Shield tablet does, and it’s $199. High-performance gaming isn’t the Predator 8's strong suit. Neither is comfort, what with those sharp edges around the speakers, not painful but pokey enough to annoy. So what is this thing good for? It’s got 32 gigabytes of storage plus a micro SD slot, so if you want to store things on here, you can store things. The display is pretty great. The 8 inch 1920 x 1200 TFT active matrix screen might not be the highest resolution available, but in most instances the highest resolution possible is silly. It’s vibrant, crisp and pleasing to the eye. And the sound. Man, the sound on this thing is the best I’ve heard in a portable Android device. Four speakers, virtual surround sound—it’s almost a shame to partially cover up part of the sound system with your hand. So don’t! My favorite way to use the Predator 8 so far is a toss-up between using it on a stand while playing games with a Bluetooth controller or using it on a stand to watch Netflix and Hulu programs. Just keep a charging cable handy, because the battery life is not great. It’s also not a bad comic book reader in a pinch. The Predator 8 can do anything other Android tablets can do relatively well, but it’s not dressed for the occasion. It’s decked out for gaming greatness, and it doesn’t quite have what it takes to pull off the look.